AVIVA SUPERFUNDAE… TOTALLY EPIC! | Beverly's Net: family. food. fashion. 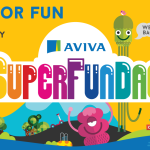 AVIVA SUPERFUNDAE… TOTALLY EPIC! – Beverly's Net: family. food. fashion. 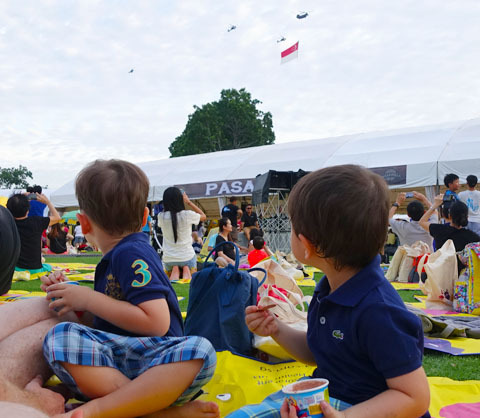 We were blessed with pretty fantastic weather for Aviva Superfundae, an outdoor event held at The Meadow at Gardens By The Bay. 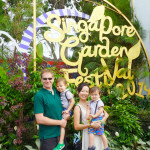 It’s a one-off family carnival that was FREAKING AWESOME, so we’re hoping that they’ll run one again next year. 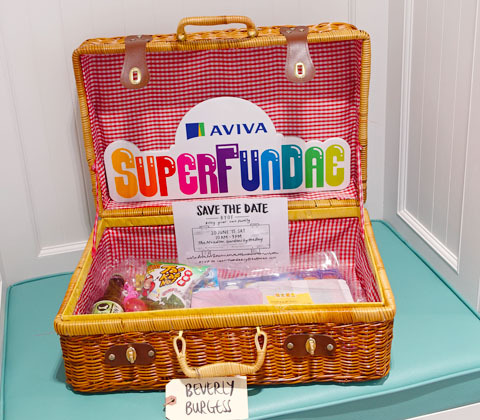 The adorable picnic kit the folks at Aviva Superfundae sent over, complete with thoughtfully curated goodies – beer (! ), snacks, painting and craft kid, etc etc. It really excited the kids and got us in the mood for the event! 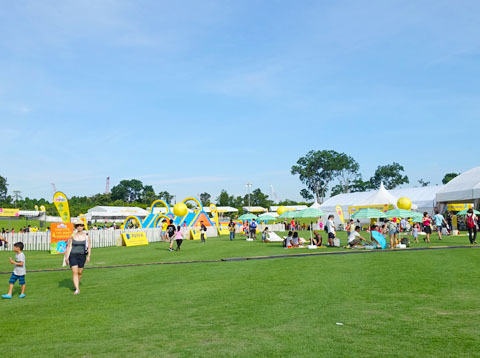 The event was sprawled out all over The Meadow. And I mean s-p-r-a-w-l-e-d. It was WONDERFUL to have wide open spaces and so so so much space for the kids to run around in. Better yet? 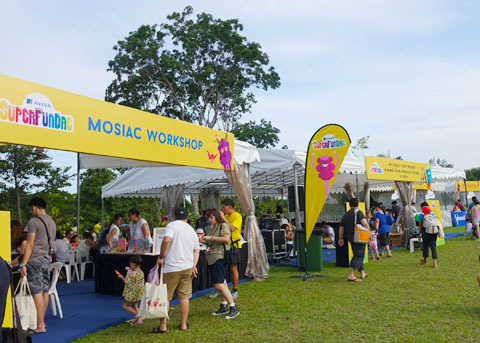 The event was ticketed – so you pay your entry fee, but the activities inside are unlimited and free. And because it was an upfront cost to enter, it meant the crowds were kept at bay and the whole event was chill, laid back, and with really lovely people there (ie. no crazies pushing and shoving). Bliss! Each section (and there were a TON of them) was allocated a tent. One of these was the Transformers area, which my kids made a bee-line to. 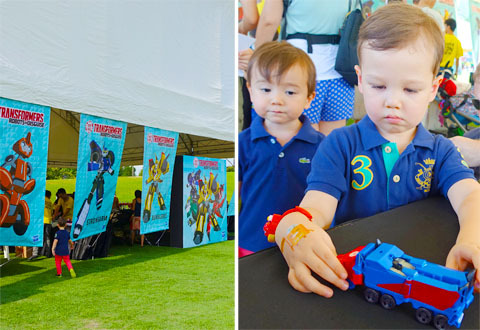 There were loads and loads of Transformer toys, simply for kids to play with. There was no queue, no pushing and shoving, and my kids could quietly and calmly just hang there and play with Transformers. Bliss, again! 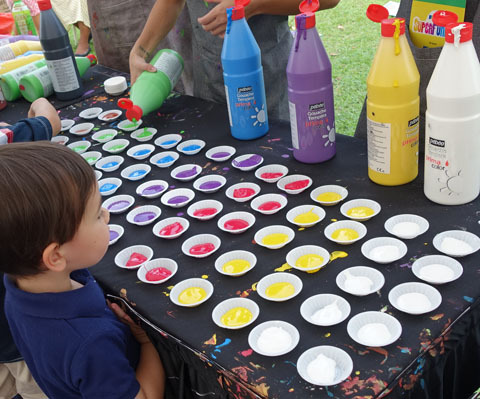 I was really impressed with this Painting section, where kids could select as many little saucers of paint as they wanted, then go nuts! We were there a bit late, so they were given thick paper to paint on. 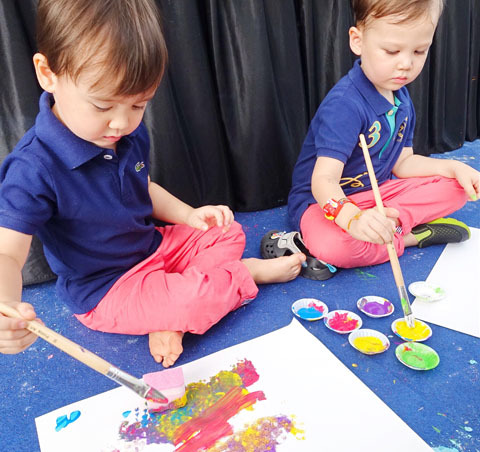 But the kids that were there earlier during the day had full size canvas to paint on – all for FREE! 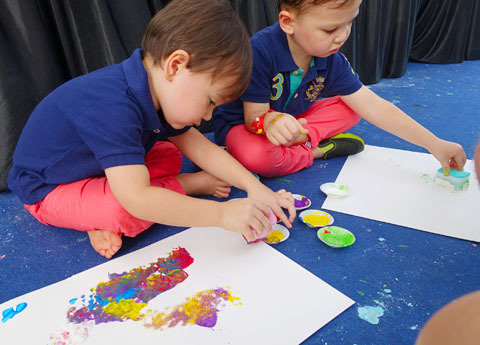 Here above, you’ll see the kids were given little sponges that they could dip in and create some textured painting. They also had the option of paintbrushes. My kids were particularly interested in mixing the colour saucers to create a new colour. 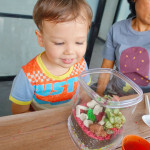 A great way to teach kids the colour wheel – hands on! Seriously, check out that view! 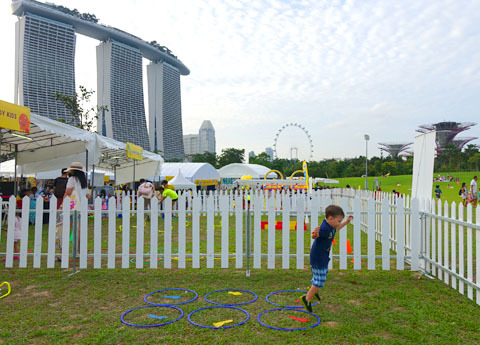 The sun wasn’t blasting, so it was actually a relatively cool day for Singapore’s standards. Hunter, surprisingly, really liked the Ready Steady Go Kids section, which was huge and divided into 3 areas. 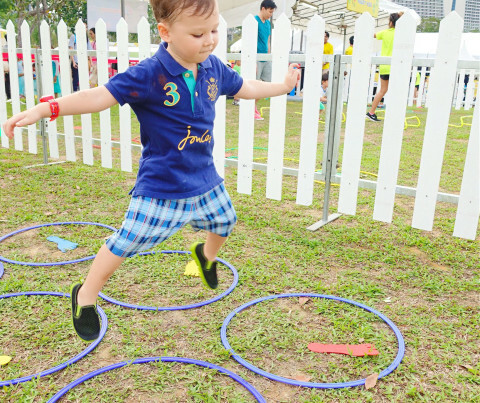 It was basically a sports obstacle course for kids. Again, no queue, and all the kids and parents there were calm and well-mannered. 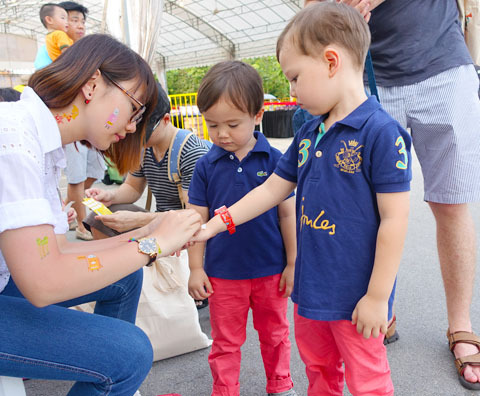 And there were so many staff hanging around – all super friendly and great with the kids. They gave high-fives all round, and were the best cheer leaders! My kids, doing all sorts of sporty stuff. It makes me proud. 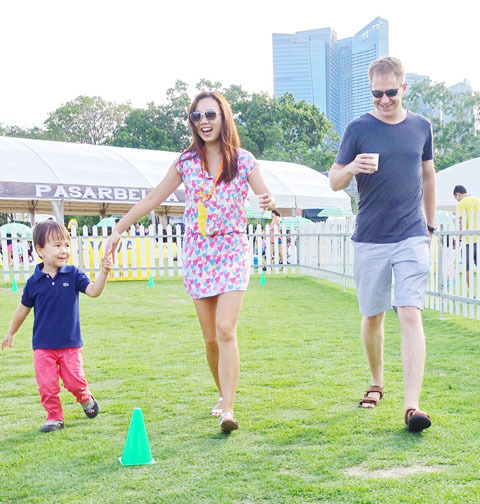 I LOVE the thought of having sporty, outdoorsy kids – though it’s actually quite difficult in Singapore because the weather’s so hot and there’s not many fun places to do this sort of thing.. 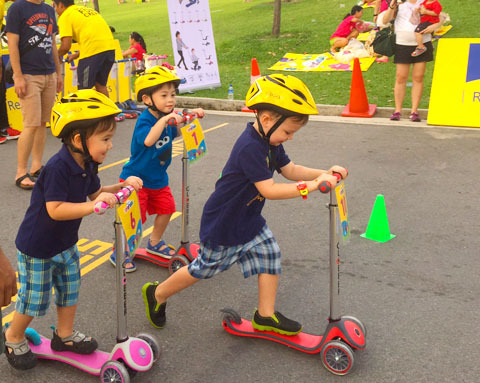 There was scooter racing, push bike racing, and bobby car racing. 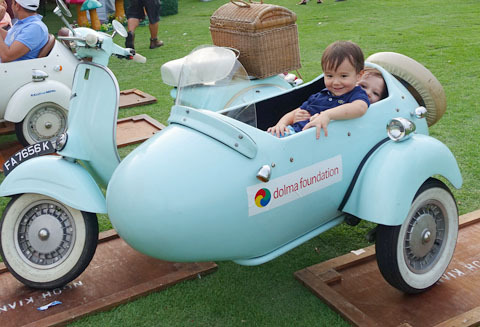 My kids had a blast on these little cars, because they’ve been eyeing them for ages…. and I’ve resisted buying one so far! 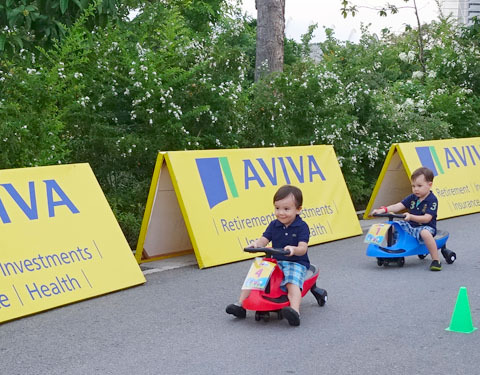 After all that epic running around, we sat down on our (free) Aviva Superfundae mats, and ate our (unlimited, free) ice cream. There was Pasarbella market there too, with delicious food. We pigged out on mac and cheese, shepherd’s pie, burritos, cider, etc.. 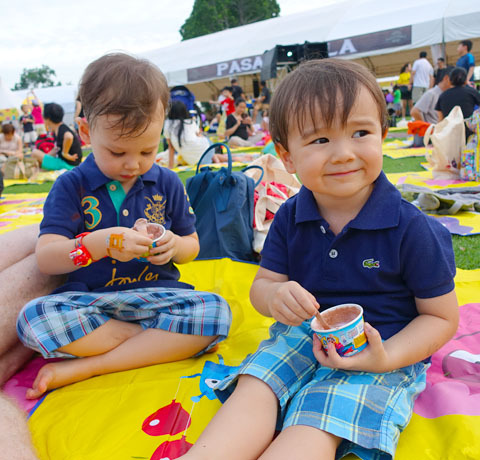 It was actually a lot of fun to sit down and have a picnic with the kids! There was even an air show with fighter jets and helicopters zooming around. It really thrilled all the little kids there – mine included. 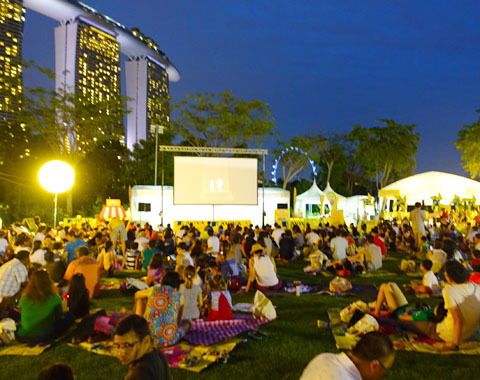 After dusk, everyone settled down and watched Mr. Peabody & Sherman, a kids movie. It was the first time EVER the kids were outdoors so late. 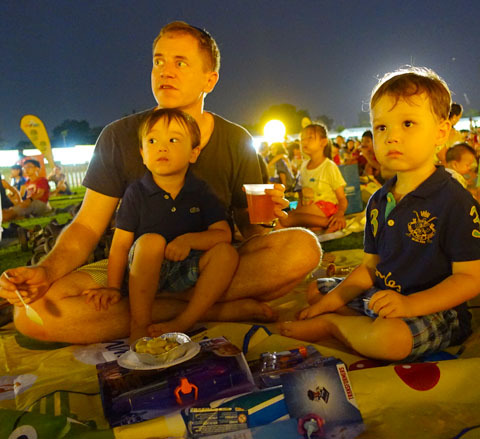 They enjoyed the movie, though kept asking if I could “turn the sky lights on” because they were a bit unsettled seeing the black night sky. LOL. It was an epic day, and we were at the Aviva Superfundae carnival for about 6 hours. I hadn’t intended to say that long (and that late), but we were having SO much fun, time just whizzed by. 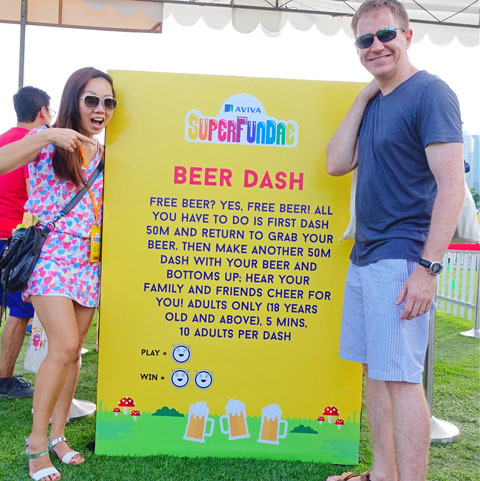 Chris and I bought thought it was the best outdoor family carnival we’d ever been to – ever. So well-run, well-organized, and with so many treats for the kids. They even walked away with tons of (free) gifts like Nerf guns and Littlest Pet Shop goodies! 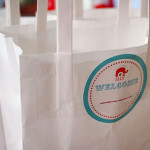 As well as tons and tons of edible goodies, snacks, and lollies. I’m seriously hoping they do this again next year. We’d be there for sure! 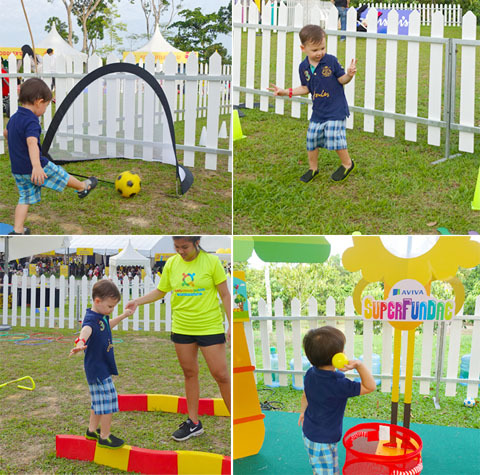 SUPERFUNDAE 2017 – a whole family day out!